I opened up my news browser to a flurry of headlines saying that the Japanese seriously underestimated the tsunami risk when they built Fukushima. A while ago, there was a story in the New York Times claiming that along the east coast of Japan there are carved stones set into the earth at intervals with inscriptions that translate roughly to "Don't build below this stone for fear of tsunamis." The story was about one village that actually read the manual and followed the instructions. They survived the tsunami. So maybe the Japanese should go back to those stones and add a footnote: "Especially if you're building something with the potential to glow in the dark for the next ten thousand years." And no, the picture doesn't have anything to do with all this. I'm just playing around a lot more in Photoshop now that I've got SuperPrinter and can, at least theoretically, print out images large enough to see the details without actually having your nose right up against the quilt. 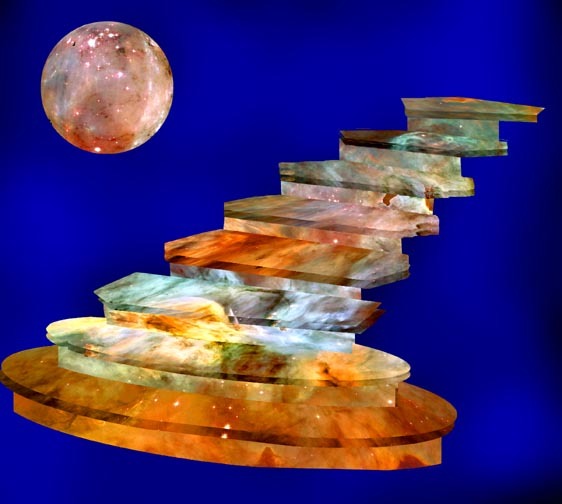 This is a staircase and a planet "built" out of a Hubble space photo. As for how SuperPrinter and I are getting along...well, let's discuss that some other time. I think we're building a relationship, but it is fraught with frustration.